A post from Medieval Codes researcher Hailey Mullock. 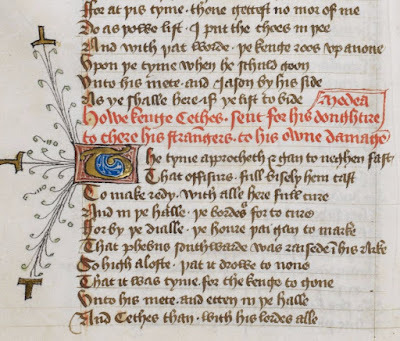 Many medieval manuscripts contain elements of decoration, from single-coloured capital letters to fully illuminated pages with illustrations and elaborate borders. The decoration was not only for visual appeal but also worked to organize the text and convey information. 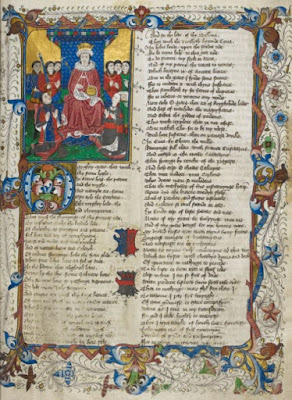 Medieval manuscripts were often written in black with few page breaks or divisions, and decoration helped to divide and highlight aspects of a text. In order for the decorations to convey information to the reader, each manuscript, and sometimes text, has its own hierarchy of decoration. The decorative elements often change in size and colour depending on their position and function. London, British Library MS Royal 18 D II, fol. 6r. The study of medieval manuscript decoration is a vast undertaking and as a result this study focuses on a single manuscript, British Library MS Royal 18 D II. It was commissioned by Sir William Herbert, first earl of Pembroke, and probably designed as a presentation gift to Henry VI (1421-1471), after Henry VI pardoned Herbert for his assistance to the Yorkists, and before Herbert received the Garter from Edward IV in 1462. The higher the status of a manuscript and the richer the patron, the more elaborate the decoration. As a result of its patronage and purpose, MS Royal 18 D II is a highly decorated manuscript, and provides a great variety of levels of decoration to study. 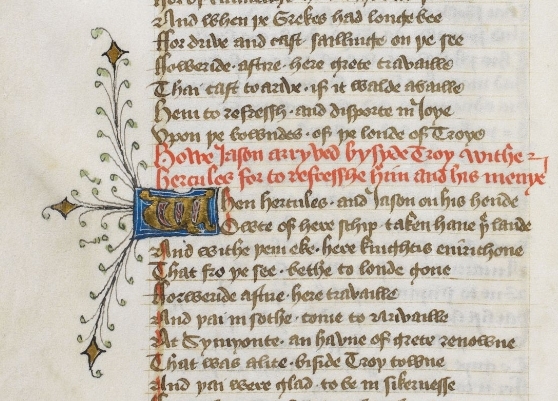 MS Royal 18 D II is a miscellany containing several texts, on of which is Troy Book. Troy Book is an account of the story of the Trojan War, written by John Lydgate and commissioned by Henry, Prince of Wales, later King Henry V. Troy Book had considerable reputation and influence in the late Middle Ages and Renaissance. The Troy Book text in this manuscript features decorative elements including display initials, rubrics, illustrations, and decorated borders. Initials of varying size and elaboration are often used as a means of highlighting the various divisions and sections in a text. Within a hierarchy, often the larger and more decorated the letter, the more important the text that follows. The text in this manuscript uses three different sizes of display initials. The largest display initials are used at the beginnings of Books, are surrounded by decorated borders, and follow an illustration. London, British Library MS Royal 18 D II, fol. 6r, detail. Medium-sized display initials are not only smaller in size but also have significantly less floral decoration around them. They are not regularly accompanied by an illustration or border. They mark something similar to chapters, the next sub-division in the textual structure. London, British Library MS Royal 18 D II, fol. 11v, detail. In Book Two, the third and smallest display initial is introduced and these tend to mark a change in speaker. London, British Library MS Royal 18 D II, fol. 40r, detail. London, British Library MS Royal 18 D II, fol. 15v, detail. Changes in colour were also often used to divide a text, the most common colour being red. Red ink is often used for rubrics. A rubric is a title, chapter heading, or instruction which is not necessarily part of the text but helps to identify components. In Troy Book the sections in red ink are most commonly introductions to new chapters, preceding a medium-sized display initial. Usually two or three lines in red give a summary of the next chapter. It is likely that they are used for navigation of the text as well as to highlight new chapters. In the hierarchy of decoration, the colour red lies in the middle of the hierarchy, lying above black and yellow but below blue and green. Black is used for regular text; yellow alone is used to decorate capitals but does not indicate textual structure or navigation. London, British Library MS 18 Royal D II, fol. 75r, miniature. Illustrations are another element in the hierarchy of decoration. 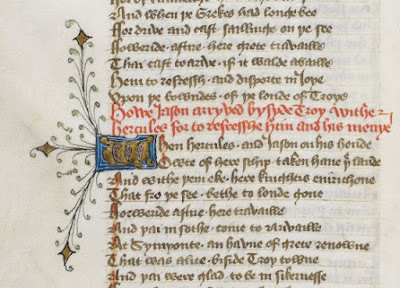 Illustrations may be in a manuscript for several reasons: to enhance the value of the manuscript, to provide a visual commentary on the text, to guide the reader through the manuscript. They commonly call attention to book or chapter divisions. In MS Royal 18 D II, illustrations are primarily used to mark the beginning of each Book. However, in Books 3 and 4, there is an increase in illustrations. 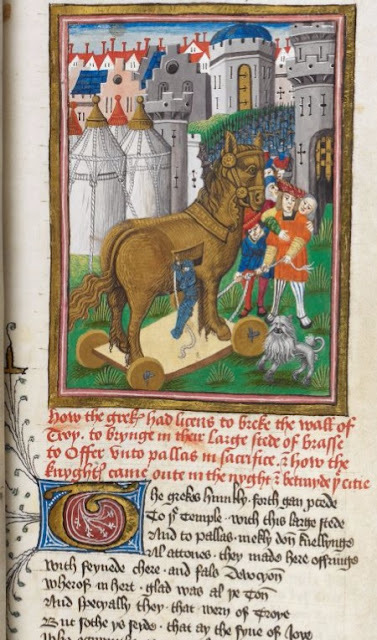 This is possibly because the contents of those Books made for striking illustrations, such as this picture of the Trojan Horse to the left. In any case, more illustrations would have enhanced the value of the manuscript. The decorative elements demonstrate a hierarchy similar to our own. Just as a modern poster has a text and image hierarchy which allows the reader to recognize divisions in the text and the level of importance of each section, medieval manuscripts have a similar hierarchy of decoration that guided the medieval reader through the manuscript. Clemens, Raymond and Timothy Graham. Introduction to Manuscript Studies. Ithaca: Cornell UP, 2007. Morgan, Nigel. 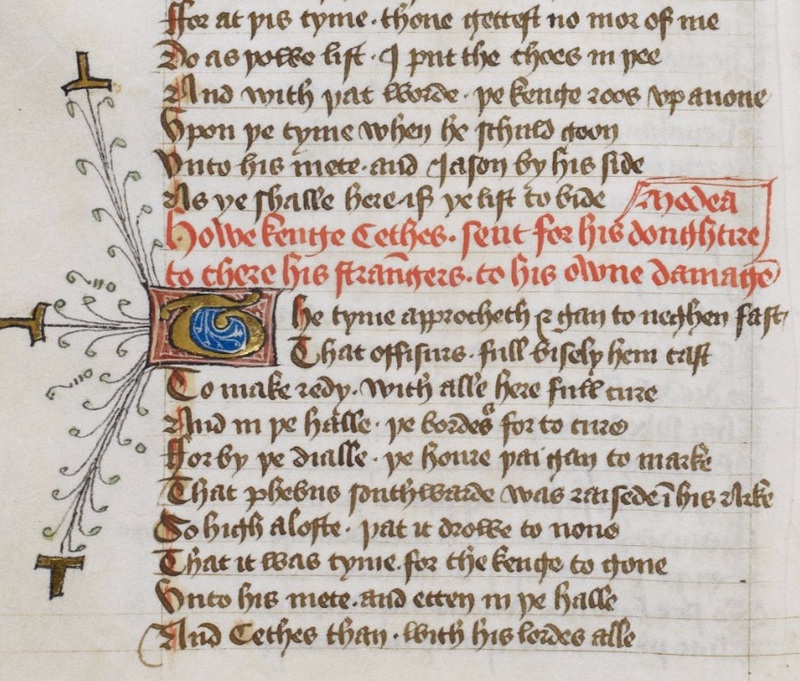 “The Decorative Ornament of the Text and Page in Thirteenth Century England: Initials, Border Extension, and Line Fillers.” In English Manuscript Studies 1100-1700, vol. 10: Decoration and Illustration in Medieval English Manuscripts, ed. A. S. G. Edwards. London: British Library, 2002. 1-33. Scott, Kathleen L. Tradition and Innovation in Later Medieval English Manuscripts. London: British Library, 2007.